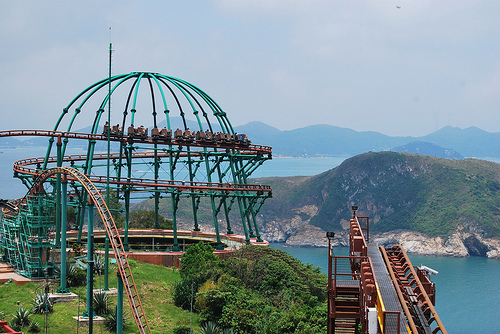 Imagine a virtual trip through the ocean park from the lowland section to the headland section. 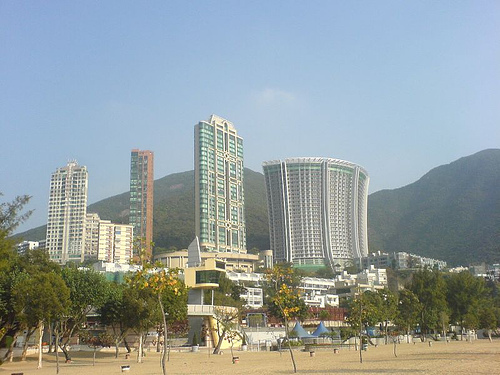 The trip starts from the Middle Kingdom neighboring the Tai Shue Wan Entrance. At the Middle Kingdom, tourists will see many ancient structures such as temples, pavilions and streets. Walking through the Middle Kingdom, you come upon the Hong Kong Jockey Giant Panda Habitat, home to two lovely pandas, Anan the male, and Jiajia the female. Both are very popular and appear contented in their lush green environs. Tourists enjoy watching them eat and sleep. 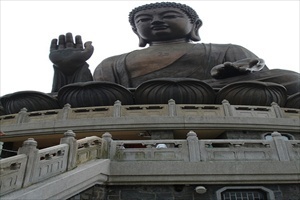 Also known as the Big Buddha, is a large bronze statue of the Buddha, completed in 1993, and located at Ngong Ping, Lantau Island. The statue is located near Po Lin Monastery and symbolizes the harmonious relationship between man and nature, people and religion. It is a major center of Buddhism in Hong Kong, and is also a popular tourist attraction. It's most popular beach, often attracting over 20,000 visitors at weekends. Because of the increasing pollution at the sea, however, most visitors come to sunbathe or laze on the beach rather than to swim. In place of the old Repulse Bay Hotel - one of the few reminders of the early colonial period until it was pulled down - there now stands a modern building with a spectacular hole built into it which contains apartments, shops and an excellent dim sum restaurant. An area with a small town feel, Stanley is away from the densely populated area with a market and a strip of restaurants plus a small shopping center. An interesting landmark is an old building moved there stone by stone from Central district and reassembled again. It's now home to some nice restaurants by the sea. Best time to go to shop - during the day. If you want to go to the typical sights you see on postcards, one place you will not be disappointed in is Mongkok. You should go in the evening after dark because then you can see the shop signs lit up in all kinds of neon lights in Chinese - just like what you see on postcards. 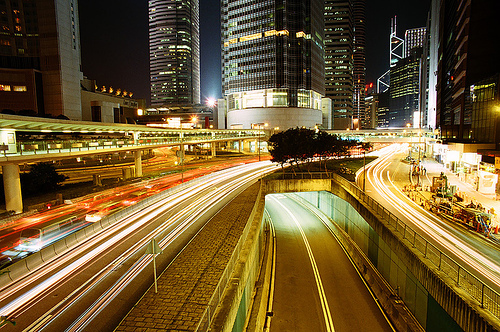 It is in the heart of Kowloon and reachable by MTR. But beware: it is crowded! After all, it is said to be the most densely populated area in the world. Even during the day, you will wonder why so many people are there. Don't they have to work?? The Peak is a great place for walks, with its forests of bamboo and fern, lilliputian Chinese pines, hibiscus, and vines of phenomenal beauty. Visitors should start from Lugard Road, which begins just opposite the Peak Tram's upper terminus at 395m above sea level. Atop the hill, visitors will be greeted with some of the world's finest views that stretch all the way to China and Macau. The hike from Lugard Road to Harlech Road, which presents views of the harbor, takes about two hours to complete. Hikes from Green Island and Peng Chau to the north, and Lantau and Macau to the west will also take about the same time. 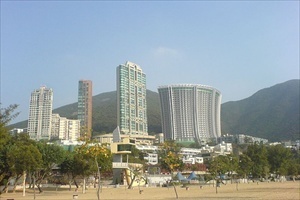 Tsim Sha Tsui is the southern tip of the Kowloon peninsula, and a major shopping and tourist area. Avenue of Stars is modeled after Hollywood”s Walk of Fame, and boasts a Bruce Lee Statue and imprints of other Chinese movie stars. It points towards Victoria Harbour. 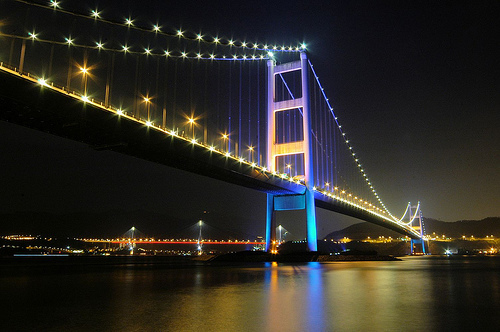 The Tsim Sha Tsui Waterfront is also the best place to watch the night view of the harbor. Every night, the tall buildings along harbor will set up light bulbs on their walls and form into a wonderful sight-seeing. Wan Chai - During the day it is worth visiting for the sake of the little market lanes with their innumerable stalls selling fresh vegetables. Other features of interest are a number of small temples. Once a typically Chinese district known as "Little Shanghai", Wan Chai is now steadily losing its original character; the old houses are being pulled down and replaced by tall office blocks, and the ever-increasing rent levels are compelling many small shopkeepers and businessmen to close down. The Star Ferry connects the two sides of Victoria Bay (HK Island on one side and Kowloon on the other on a peninsula of China). The Ferry is inexpensive and the gorgeous views are regarded by many as the best in the city. In good weather, climb to the top of the ferry and sit outdoors. A popular gathering place in the Central district, this picturesque square is surrounded by some of the most magnificent buildings in city. This is HK’s administrative centre, an amalgamation of contemporary architecture with some spectacular designs. Check out the Bank of China Tower. Heritage Museum has received an embarrassment of praise since its opening, and thankfully it's all well deserved. As the biggest museum in the city, it features a wide selection of exhibits, many of them interactive. It is also the best place in the territory to soak up some knowledge on the history and culture of the New Territories. This is a must-see museum full of splendid high-tech audio-visual displays telling all about the region’s heritage and natural history. Cheung Chau Island is probably one of the prettiest islands around here and is accessible by half hourly ferries. Southeast Cheung Chau boasts of paths that wind around headlands and curl up and over hillsides, passing through woodland, and near to naturally sculpted giant boulders, once grand but now ruined houses, a couple of temples, a tiny nunnery, and cliffs dropping to the sea. The main trail here is rather fancifully named the Mini Great Wall, but you can find other less known yet still fascinating paths to explore. Aberdeen To get a close-up look at the Aberdeen way of life, many visitors take a sampan ride or take in the view from one of two magnificent floating restaurants anchored here. Three-storey high and elaborately decorated with swirling red and gold dragons and other traditional Chinese motifs, the experience is not to be missed. Neither, of course, are the delicious fresh seafood and the excellent Cantonese fare on offer. Although only a few miles from urban area, the remote, pristine beaches on the eastern edge of the rugged Sai Kung Peninsula seem like another country. There is no rail link and few roads, so you will have to make an early start, taking a bus to Sai Kung town, another bus to Pak Tam Au, then walk the hilly 4-mile (6-km) footpath to the beach. Alternatively, hire a junk. The reward for your effort will be glorious surf, delightful hidden pools and shaded cafés.